When we grow older, the thought of venturing out after the rain often makes us think of cold winds, leaking shoes and messy mud. But for kids, the rain brings magic. Because after the rain comes puddles to find. To jump in. To make a mess in. In Puddle Hunters, Ruby and her brother Banjo eagerly await the end of a storm so they can go hunting for puddles. They venture outside and search the yard. Out on the street, they canvass the sidewalk. In the park they check all nooks and crannies. Finally, on the river flats, they find what they’ve been looking for. 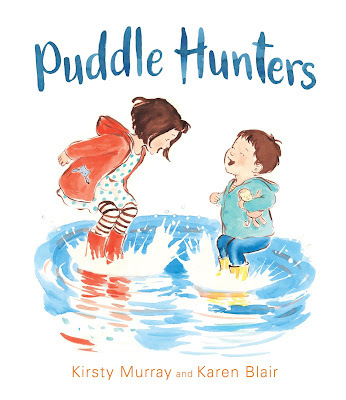 Puddle Hunters explores the joys of being a child, of finding happiness in the simple things, like jumping in muddy puddles. This is a book young children will adore — either because they already love jumping in puddles or because it will inspire them to try it. Hopefully, too, it inspires mums and dads and carers to do the same. Because if we forget about the cold wind and leaking shoes and muddy mess, we can all experience the sheer thrill of engaging our inner child. Puddles Hunters is pure joy in book form. Kids aged two to eight will love it.